I have never written any race report with such heavy heart that weights like Titanic anchor, and tears just streamed down my face nonstop that I could barely see any words on the screen. This post took me over six weeks to finish and I had to use past tense as past tense. How little did I know or prepare what this race would mean to me eventually, and a race that I will forever treasure in my heart. 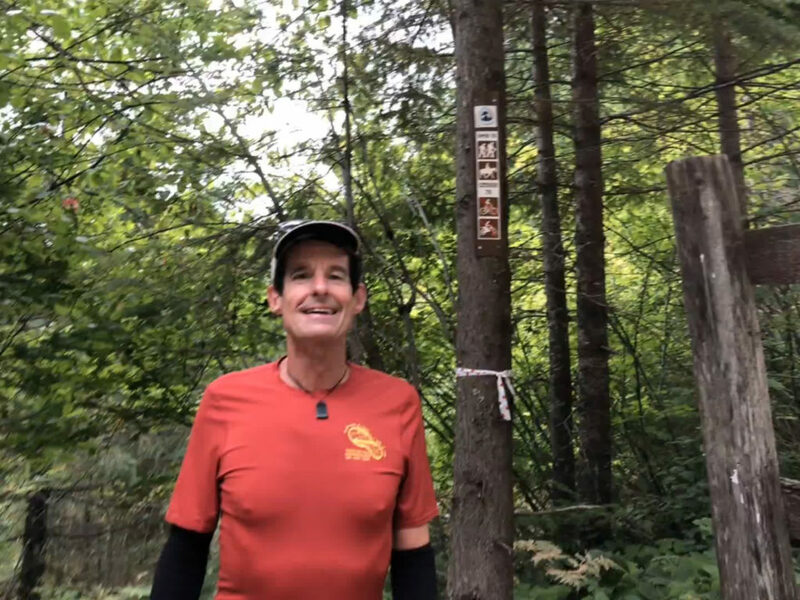 Last year when I was hopping around with crutches I went to a Trails in Motion movie event with Dennis, and one of the films was about ultra runners attempting to set a FKT at Pacific Crest Trail. After unforeseen challenges they had faced and dealt with, the crews eventually finished that run but not the runner at the Bridge of The Gods. I have found the film so inspiring that I had talked couple times that I wanted to see that Bridge. For the last an year and half Dennis and I had talked about going to PCT, but due to my two injuries it just sit on the back burner all these time. 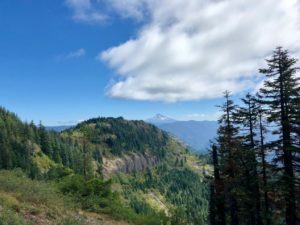 In July, when a running friend of mine in Oregon suggested two races on PCT, Dennis and I decided to sign up the Three Corner Rock PCT 50K after seeing those beautiful pictures. This year Dennis didn’t have any business travel for the first 6 months, so we have been to lots of places to run just for the fun of it. But very unexpectedly he had so many short trips in Aug and Sept, and he was asked to be in Europe for 6 weeks for a job function that was not even his. He wasn’t too happy about being away for so long, so he made sure that he arranged that 6 weeks trip to Italy after we coming back from Oregon. 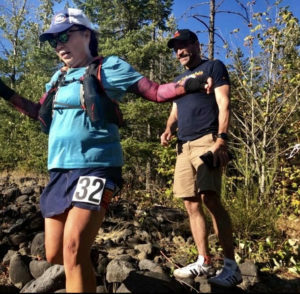 The start of this race was at Whistle Punk Trail head, near Carson, in Washington, and the course followed the Pacific Crest Trail except for a short out and back to Three Corner Rock, with the last few miles to the finish at a park near the Bridge of The Gods. The elevation profile looked OK to me, and after the scary altitude sickness experience at TRT this summer, Dennis has repeatedly told me that he would never let me running alone at any trails, and he would run every race with me in the same distance category and together. Fri Aug 31st, we left San Jose at noon and I wasn’t feeling too well because of lack of sleep over the last two weeks. I was having difficulty to deal with his frequent trips and our time differences, and some issues from his past that we were struggling with. 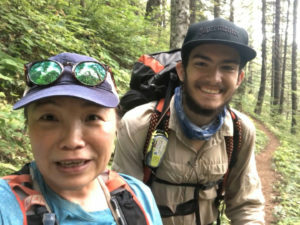 Though a bit sick, we both were excited about going to Oregon/Washington, the race, the Bridge, the waterfalls, the Columbia River, the beers and coffee..etc, but most importantly was to fulfill my dream of being at PCT with Dennis together. He loved checking off my bucket list together with me, like our Mt St Michel race in France. 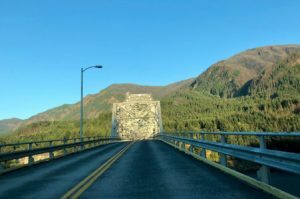 The drive from Portland airport to North Bonneville was pretty straightforward, except we couldn’t see much of the mountains or river because Pacific North West got dark so early. Dennis was playing tour guide and describing the forest and waterfalls to me from memory of his other ultra races here. It’s pretty funny that we heard the “Now you are entering Washington (or Oregon)” from Google Map many times over that long weekend. 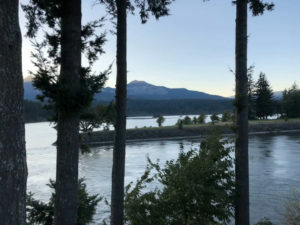 We stayed at Stevenson, a small town facing Columbia River, with one main street and some small shops, one gas station, one market.. but all the business were already closed and only the gas station convenient store was still open that allowed us to grab some bread and water. 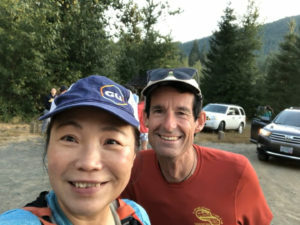 On race day morning we drove to the finish area and got shuttled by volunteer to the Whistle Punk Trail head; I had two soft flasks of water and plenty of GU Gel. And as always, Dennis carried two water bottles in case I needed extra. It’s a fairly small local race, and we liked the vibe immediately. Couple runners came up to ask about the TRT shirt that Dennis was wearing. I found a spot to enjoy the warmth of sunshine and took a rare race selfie with Dennis since we were in the same distance this time. All these little things didn’t seem to be significant on that day, but now they are the most memorable moments from this race. We let the fast runners went out first, and just followed the conga line into the Whistle Punk with Dennis running ahead of me. I have always followed him every where we went because I always felt safe with him no matter the terrains or course, including when I couldn’t see with my contacts lenses problem at MUC50. He brought me back when I only had 10% of vision. The morning sun shined into the lavish fern-ed trails, and I immediately went “wow, this is so beautiful!” Around mile 1.5, Dennis jumped and screamed “Ahh!!! !” I thought that was from the excitement of seeing something, but within 5 secs I also screamed after a sharp pinch and pain on my left shoulder. We got stung by wasps just like Kilian!!! The trails were amazingly beautiful and unlike anything I have seen in California, ferns, berries, skinny tall trees (like Dennis), green forest, and the terrains were soft and cushiony to run. We stopped so many times to take pictures, and stood side by side to admire Mount Adam in the distance. Such amazing experience that we got to share together, and wouldn’t want it any other way. There was a 6hr hard cutoff at Three Corner Rock summit, and I worried that I wouldn’t make it. I told Dennis that if I miss the cutoff he should continue to finish the race, and I would try to get a ride back to the finish from one of the volunteers. He said “hell no, I will never leave you no matter what. 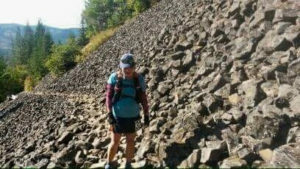 You are way more important than any race.” Once we got to the Three Corner Rock aid-station, it was very windy and chilly; I stayed at the a/s chatting with volunteers and a guy that’s dropping there, and I let Dennis went up to the summit to check out the rock and view. He disappeared into the fog with excitement but came back all disappointed. “There was no view, just all fogged up!” “Fake news!” he frowned. 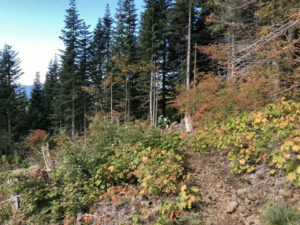 From time to time we would be out of the rocky sections, the autumn-ish scenery was truly beautiful and the single track with overgrown plants was nice to run through. It’s such a unique experience of up and down, and high and low, mentally. But because I slowed down so much while walking through those rocks, I worried that I would miss the cutoff. At the second to the last aid-stations while filling my bottle, I looked at my Garmin and mumbled “I don’t think we can make it” with despair. The aid-station captain heard me and said “you have about 2 1/2 miles left and you have almost 30 mins still.” The whole world just brighten up hearing that!! I grabbed a PBJ and took off. I ditched Dennis!!! I ran at my road-race pace from there and Dennis was shouting with snacks in his mouth and hand “what? you are leaving without me?“ and I could tell from his voice that he was totally amused! 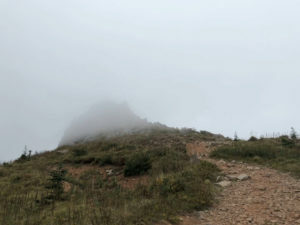 ^+++^ We ran hard and fast and past the last aid-station without stopping; only paused for a few seconds asking “which way?” as we exiting the trails and running on dirt path toward the town. But no one warned us about the most ridiculous section of this race right in front of us. 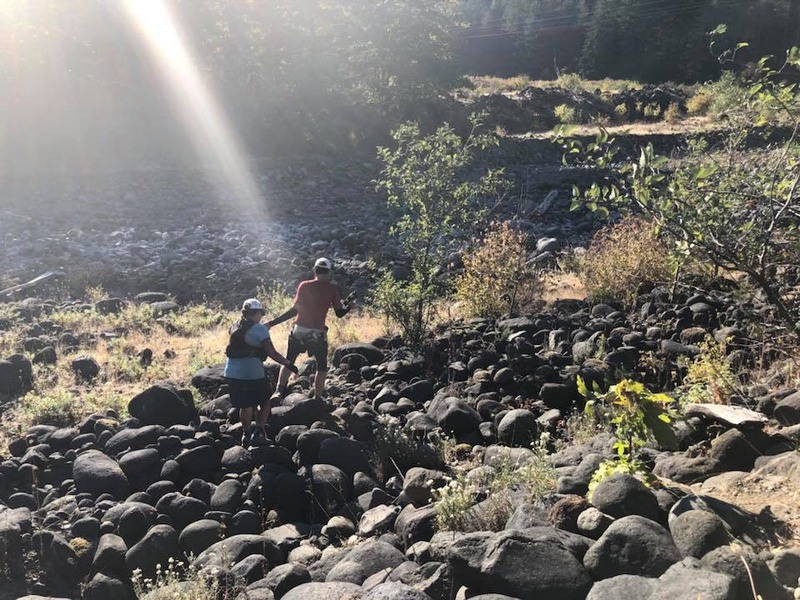 We came to a dry creek where my friend Greg was course marshal there, and there were piles and piles of huge rocks in the riverbank. That was a serious WTF moment. I mean, seriously, after running 30 miles, who would do this to a runner? First we needed to go down to the bottom of the creek in order to walk across the riverbank. Dennis had to hold my hand tightly and helped me carefully walking though, so I wouldn’t hurt my bad ankle. And there was this huge wall that’s taller than Dennis and “where is the rope? “ he complained. He climbed up first and pulled me up, then we both fell and landed on our butts once I reached the top. We got up immediately and started sprinting again. We ran through some industrial warehouses area, underpass a bridge, and came into the park seeing the arch and volunteers in sight. Dennis said “let’s pick up the pace!” but I couldn’t! I felt the urge to use restroom so badly that if I had run any faster there would be serious accident! We crossed the finish line and I went to the restroom FIRST before even got my shirt or beer. My friend Greg was there and it was nice to hangout at the finish, and I introduce Dennis to him. Over beer and tortilla, we talked about the run, the rocks and a dog that he found by the creek. Since he was in no hurry to head back to Portland, and the late afternoon sun was so warm and comfortable, we decided to meet up later after we showered & changed. Dennis and I had such a great time with Greg at that Thunder Brewing Co. and what an absolutely wonderful evening by the Columbia River! We had discussed about our future plan since summer, but never narrowed down the location. I wanted to move out of Bay Area. Throughout that weekend, I think we have found the place for us, together. But so very sadly, this is the last race we ran together and our last trip together! Sorry, Michele, for your loss. Thank you for the words; it brought tears to my eyes and I couldn’t believe that I actually got to meet you in person and thank you at Huddart Park this morning. Hi Michele! That was very sweet of you to remember me when I met you yesterday. I looked for you after the race, but you must have gone home already. Thank you again for volunteering. I love the ultra community, too, and I hope to see you again. My next race is Miwok 100K on May 4. 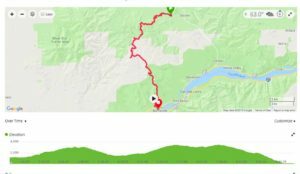 You have TRT 50 mile coming up, right? I love that race — I’ve done that 50 mile race twice and hundred mile once.